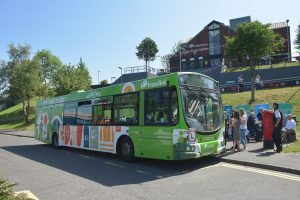 Translink is working with Groundwork NI on a “GrowBus” community gardening project, which will teach children living in temporary accommodation about the benefits of growing fruit and vegetables. The “GrowBus” will travel across NI, with a team of 9 trainee community gardeners who will demonstrate how simple it is to grow crops, with an initial pilot involving ten locations. The “GrowBus” will also show children simple experiments such as how corn is made into popcorn and how a potato can be used as a battery, to develop their interest in the science behind food. Translink’s Environmental Manager Andy Bate said: “We are delighted to be working with Groundwork NI on the “GrowBus” initiative to bring education and nutrition advice to children currently living in temporary accommodation. It will be interesting for children to learn where their food comes from and and see how easy it is to grow fruit and vegetables, as well as letting them sample some locally grown supplies. “We recognise that there is a general disconnect of the fact that food like fruit and vegetables are grown in the ground, and how healthy, easy and cost effective it is for families to grow their own. Andy concluded: “Go Healthy, Go Together and Go Eco are all key strands within our Translink Corporate Responsibility Strategy and the GrowBus Project is enabling us to lead, inspire and succeed in delivering our SPIRIT values both inside and outside the organisation”. Paula Quigley chief executive of Groundwork NI said: “We are excited to be bring the project on the road across Northern Ireland, bringing our Community garden experience to over 150 children. For many of them it will be the first time they have tasted some of the foods on board and the first time they have planted anything. We will also be using Science experiments to spark their interest in learning how their food grows. “Another element of this project that we are very proud of is that it would not have happened without the Public, Private, Social and Charity sectors coming together to use their resources to support this fabulous programme”.